Oregon gumweed is perennial herbaceous species found in North America from southern BC to northern California where it is found in beaches, rocky bluffs, and disturbed sites. Flowers are yellow, daisy-like; it is summer flowering. Appearance varies with the environment (Douglas et al 1998). Perennial herb from a taproot and a stout branched stem-base; stems erect or ascending, several, usually branched, nearly glabrous or with long, soft hairs, 15-80 cm tall. Basal leaves alternate, toothed or entire, lower ones oblanceolate, up to 40 cm long and 4 cm wide; stem leaves unstalked, sometimes clasping. Inflorescence of solitary heads or a flat-topped cluster of heads; disk 1-3 cm wide; yellow rays 10-35 or more; involucral bracts slightly or moderately sticky, outer ones long slender, green-tipped, loose or spreading but not regularly reflexed. 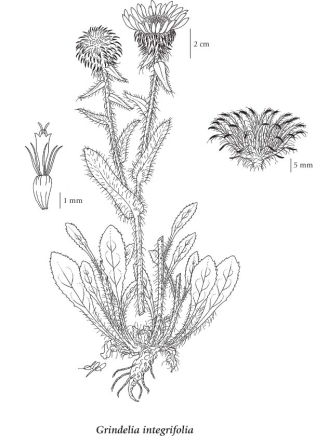 Achenes compressed, scarcely nerved; pappus of 2-several deciduous, firm bristles. This is a highly variable species which has received various treatments. Douglas (1995) concluded that it was best to recognize only one environmentally variable species. Mesic to dry beaches, coastal bluffs, waste places and roadsides in the lowland zone; common in coastal BC; S to N CA.